ANZAC Day is held each year on the 25th April, which is the anniversary of the landing of the ANZACS at Gallipoli. But ANZAC Day is bigger than just Gallipoli. It is the day on which we remember all Australians who served and died in all wars, conflicts, and peacekeeping operations. Contrary to concerns a number of years ago that ANZAC Day was going to die a slow natural death, renewed interest in this very special day has boomed. It is now arguably one of the most important days on the Australian calendar. It also has great significance to our friends in New Zealand. 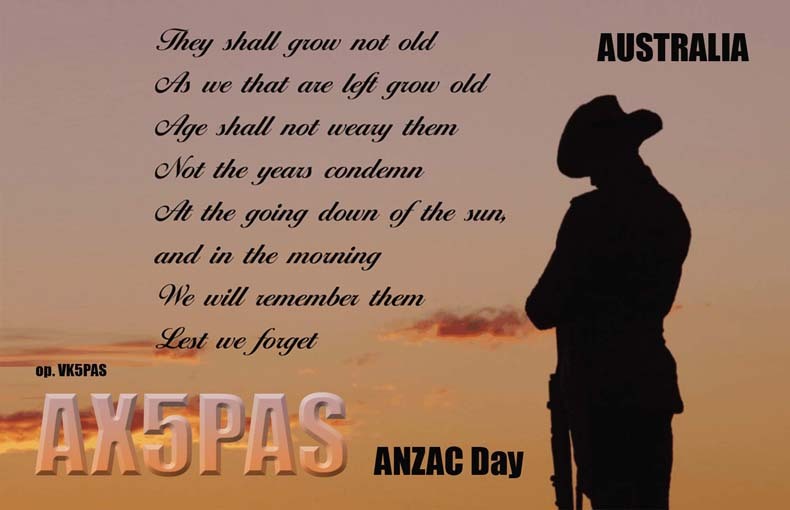 Below is my ANZAC Day card for AX5PAS. I was hoping to activate the Belair National Park today but the weather was terrible. It was raining here for most of the day, making portable activity virtually impossible. Plus I was working dayshift today, so by time I finished work it was getting a little late. So I decided to do some operating & chasing from home. I jumped on to 20m first and worked quite a bit of DX, ending up with a mini pile up. The AX prefix was in high demand as usual. But when things got a little quiet, I took the opportunity of having a look around the bands. I had been closely watching the DX cluster and had seen a number of park & SOTA operators spotted on the cluster. 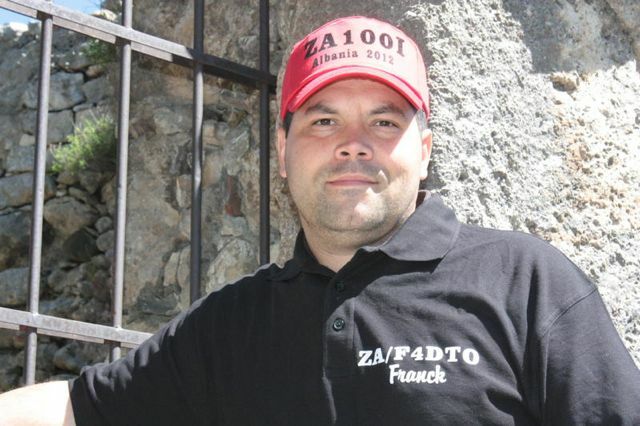 My first park contact was with Franck F4DTO/p who was portable in FFF-300, a new park. It was a little hard too copy Franck at times as the static crashes were very strong. In fact they were over S9 at times. But we managed to make it and Franck gave me a 5/7 signal from France. My first Australian SOTA contact of the afternoon was with Andrew VK1DA who was operating with the special call of VK100ANZAC from SOTA peak Mount Ainslee, VK1/ AC-040. Andrew had a very strong 5/9 plus signal. Mount Ainslee is 843 metres above sea level and is with 1 SOTA point. This was followed by a SOTA contact on 15m with John VK6NU who was operating with the special call of VI6ANZAC from SOTA peak, Mount Randall, VK6/ SW-039. John had a nice moderately strong 5/7 sign coming in from Western Australia. Mount Randall is located in the South West region of Western Australia and is 523 metres above sea level. It is worth 2 SOTA points. My first DX SOTA contact for the afternoon, was on 20m and was with Mike 2E0YYYY/p who was on the top of SOTA summit, Bardon Hill G/ CE-004. Mike was coming in beautifully on the long path, a genuine 5/8. I received a 5/9 signal report in return from Mike. Bardon Hill is 278 metres above seal level and is worth 1 SOTA point. 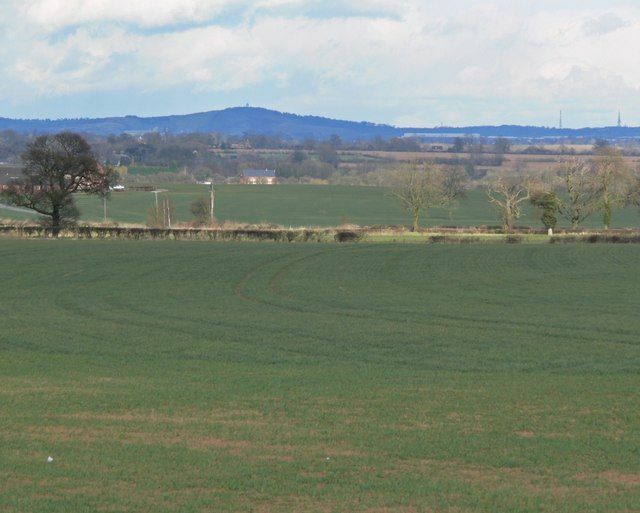 It is located in the Central England Region and is a former volcano. The name Bardon is derived from ‘bear den’. It is reported that the last bear in England was killed here. More information on the summit can be found at….. When I finished working Mike he asked me to stand by as he had company on the summit. I then worked Rob G7LAS/p who had a nice 5/8 signal. My next SOTA summit contact was on the 10m band, with Herbert, HB0/OE9HRV/p portable on SOTA summit, Helwangspitz, HB0/ LI-011. The summit is located in the Raitkon range in Leichtenstein and is 2000 metres above sea level. It is worth 8 SOTA points. The cluster was alive with a number of SOTA and park activators. However, the static crashes were very severe making it incredibly difficult to hear many of them. And sadly, those that I did hear, were only working fellow Europeans. The ‘EU wall and the static crashes made things less than ideal. It was quite frustrating, as I had not seen for some time, so many WWFF & SOTA activators up on the bands at the same time. You can see below, where all the noise was coming from. Huge storms in New South Wales. The images are courtesy of weather zone. After tea I worked a number of VK stations hoping to get the AX prefix award on offer by the WIA. With the special event stations in my tally, I managed to get over the 100 point line. I then booked in to the Southern Cross DX Net and worked number of USA stations. But the most interesting contact on the net was with George HP/KC0GP who was maritime mobile on the ‘Carnival Magic’ in Panama 5/7 both ways).